Aquaculture and conservation don’t necessarily go hand in hand. Fish farming, for example, can be quite detrimental to the environment if done improperly. So, when sustainable food and environmentalism meet it’s a big deal, and luckily for us, it’s in the form of something truly delicious—the oyster. Recently, I had the opportunity to volunteer at an oyster farm, and as a conversationalist and seafood lover, I had to accept. Oyster farming is something that I have been curious about for a while, and with my recent move to the Outer Banks, I decided to follow up with it. 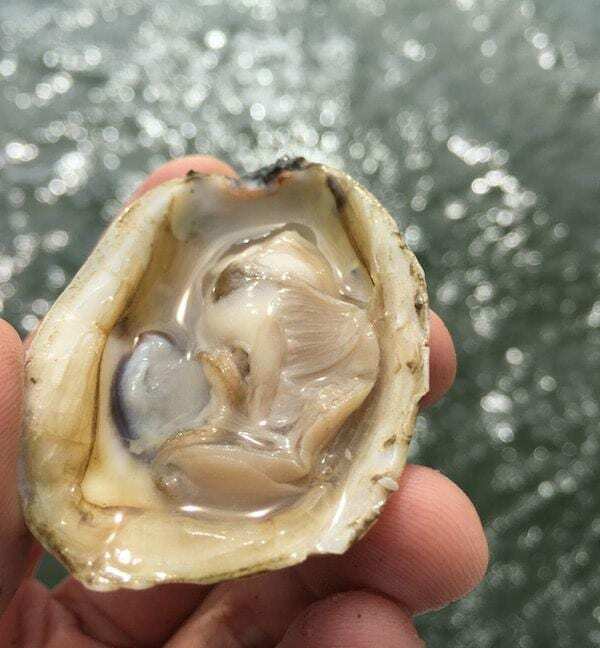 While talking to a friend who worked at the North Carolina Coastal Federation, I was introduced to Katherine McGlade, a local oyster farmer and co-owner of King’s Point Oysters, a small farm in the Pamlico Sound off Hatteras. On my first chance, I took the hour-long drive down from Nags Head. The day started unseasonably warm for a February, with clear skies reported for most of the morning. I arrived at the dock early, a dead giveaway that I was an overly excited newbie. Shortly thereafter, I was greeted by Katherine, her husband Spurgeon, their helper Henry, and their de facto captain, a Springer spaniel named Merit, who may have loved oysters more than all of us combined. Our duty today was to split the oysters planted in August from one bag into two separate bags, giving them more room to grow. We packed the boat with 40 empty floating cages, soon to be filled with premature oysters and strung out in doubles in a 400 by 600 square foot area. Immediately in the boat, I started picking Katherine’s brain about oysters and quickly learned that the process was harder than I thought. Getting the farm off the ground in the first place was incredibly difficult, and Katherine explained to me that whether or not a permit is accepted is up to the Army Corps of Engineers. Their biggest concern is for the survival of “submerged aquatic vegetation” — sea grass for the layman, which in this case is me. Submerged aquatic vegetation is home to juvenile fish and sea life, and those that give out permits know they are essential to the health of Pamlico Sound and Hatteras in general. Apparently, if even a blade of grass is disturbed, the entire farm plan could be scrapped. Katherine and Spurgeon are as environmentally conscious as you could be, for years making their living off of the seafood Hatteras has to offer, and they understand that as important as the benefits of seagrass are, a floating farm’s overall impact is minimal and also confers positive benefits as well. 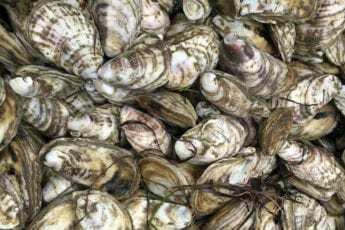 Oysters are filter feeders and spend their time sucking in the surrounding waters, distilling it, and shooting out clean, pure water. A healthy oyster can filter 50 liters of water a day, leaving the bay cleaner than without it. Oysters are both the reason for, and product of, a healthy ecosystem. Katherine and Spurgeon’s farms are floating in six feet of water, with their only contact with the bay floor in the form of a few six-inch PVC pipes. This makes them much less of a danger to the submerged aquatic vegetation than a farm that lives on the sea floor. Still, she had to go through four years of paperwork to get a permit. “Just typical governmental overreach” McGlade explained to me. I nodded. Not only are regulations hard, but they are also vastly inconsistent from state to state, which explains how Virginia’s oyster economy is booming and that of North and South Carolina are having a hard time keeping up. As we leave the dock, I change the subject to what I came down here for. Now in open water, we sped off to the farm. We slow down as we approach the farms, and as the engine roar subsides Katherine explains to me that these oysters are called triploids, genetically modified so that they can grow faster and bigger. That might sound scary, but it shouldn’t. Most oysters that we eat today are genetically modified, turned from a two DNA strand diploid to a three DNA strand triploid. The uneven third strand removes their ability to reproduce, so they are growing year-round rather than wasting their energy trying to breed. In the summer months, when the diploids are getting skinny cruising for mates, triploids are hitting the gym and getting big. These modifications allow farmers to get healthy oysters in just one year, and they can be planted at any point. Katherine and Spurgeon have multiple harvests, so each day is different. 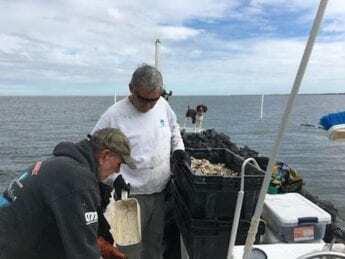 After they “plant” the oyster, they come out multiple times a year to handle them and split them into more bags so they can grow larger and don’t have to compete for food. Shortly, they become the 3 inches needed to sell and are off to restaurants all along the coast. Although the bags were in perfect rows like they are on a farm on land, each one was in vastly different conditions. Some bags were filled with large, beautiful oysters, and others were filled with shells that were smaller or already opened, indicating they have died. You could hear the difference before you saw it, with the smaller, dead ones emitting a hollow sound while being poured. As with agriculture, the farming is heavily dependent on merciful weather. 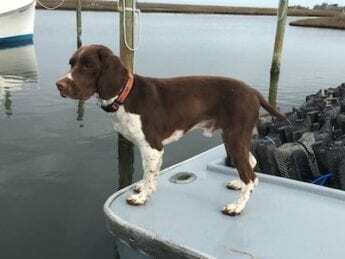 King’s Point Oysters lost over 300 bags due to a recent nor’easter, sending Katherine and Spurgeon searching over the bay for bags that have run ashore. Out of the water for an extended period of time, many of the oysters in those bags came back either malnourished or dead. As with any time I am working out of my element, I found myself saying thank you and apologizing too much. Merit loves oysters almost as much as his humans. With Katherine, Spurgeon, and Henry the work was fluid and pleasantries were implied rather than vocalized, and I stuck out like a sore thumb. In the beginning, I was pretty lost. More than once I found myself hollering to Spurgeon to let me know if he needed me as I talked with Katherine about policy, procedures, and production as I crushed juvenile oysters under my heel for Merit to enjoy. But quickly thereafter, I shed my newbie status and began to join the flow. With my newfound understanding came the right of passage associated with manual labor: the art of friendly insults. After I began to prove my worth, or at least that I knew the difference between the bow and the stern, trust was gained and light jabs began to fill the boat. While shoveling, we ragged on each other from everything to smoking habits (Henry), bad haircuts (notice how there are no pictures of me in this entire post), to names (I’ve never met anyone named Spurgeon before). All in a day’s work and, like with oysters, it seems we only roast the ones we love. We threw out the dead, opened shells, as Merit stood on the bow staring at the water in disbelief. While Spurgeon was my source of avuncular razzing, Katherine was the source of most of my information. I see Katherine as a bit of an inspiration, and I didn’t hesitate to tell her so. After having spent 15 years as a Senior Vice President with Staples, Katherine came to the conclusion that she wasn’t doing what she truly wanted to. She then went to Duke University to continue her education with a Masters of Environmental Management specializing in Coastal Environmental Management. Stories like that give hope to self-corrected film majors everywhere (speaking for a friend, of course). Katherine worked for Duke Energy for a bit, assisting them with a tentative proposal for bayside windmills before they would consider a seaside project. But consulting wasn’t cutting it, McGlade wanted to be outside, which makes sense, few office views beat their current one. With Spurgeon being a local, she knew that she’d end up in Hatteras, but was unsure of how exactly she’d utilize her newfound knowledge with her degree. Then she came up with the idea for what became King’s Point Oysters. “We’re called King’s Point Oysters, but we are on Slash Creek so we also call them Slash Creek Oyster Farm, which for some reason restaurants like more,” Katherine said. It looks like even on the quiet of the sound we can’t escape the grasp of marketing. Nothing compares to a fresh “Deby” right out of the sound. I could swear that I had eaten an oyster before. I could swear that I had eaten them raw, steamed, and roasted. I could swear that my fiancé and I have celebrated the last five Valentines Days at the Stumpy Point Oyster Festival, and this year alone I went to two fests, easily slurping down 150 oysters between the two events. But I must have been wrong, I had never had anything like these. These oysters were incredible. Small, salty, and raw, they were the best I had ever had. Momentarily, all talking had stopped as we ate them plain, the fresh saline air the only garnish we needed. As we passed around the dull oyster knife and took turns opening the beautiful bivalves (with Merit watching hungrily), I started my personal interrogation process that I generally do after having spent a day doing something that I loved that also helps the environment. “Could I do this full time?” “Could this be my life?” “Could I drop everything and live this life with my wife, a dog, and a boat?” Gently rocking in the waves of the pristine Pamlico sound, I knew the answer was yes. Under Merit’s supervision, I slowly finished the oyster I was eating and threw the empty shell overboard just as we turned the boat around and headed home. Brian Platt is an amateur oyster farmer, conservationist, and writer for DontForgetYourBoots.com. Construction slowed down while crews waited for steel roof trusses to arrive, but the building at the corner of U.S. 158 and East Atlantic Street in Kill Devil Hills is finally taking shape. The Business Accelerator is a place where new and existing businesses can meet with clients, conduct business, obtain resources, use equipment, and more. Any and all businesses are welcome to utilize the space. Every Outer Banks local and every Outer Banks vacationer has a story about why this place matters so much to them. Because of this, we have many celebration of life ceremonies and gatherings here on our beaches. good article but I think the folks in Virginia are not processing the permits any faster. they are allowing more of them, maybe due to more habitat and more oystermen, but still takes time to go through the paper work and they have a pretty hefty backlog. Commentary: When will Spectrum put its customers first? The Outer Banks Voice is not responsible for the content of external sites. ©2019 The Outer Banks Voice The Outer Banks Voice is not responsible for the content of external sites.